Population ageing - a growth in the proportion of a population that is in older age - is now occurring in every region and nearly every country of the world. Indeed, the growth of older populations is among the important global phenomena of the twenty-first century. It poses both opportunities and challenges for societies and policy makers, but these are far from uniform worldwide. Dynamic factors are at work impacting on how ageing will influence people, places and policies and there are large variations in the rate and timing of population ageing across countries, owing to differing social, health and economic circumstances and a variety of policy options from which to choose. 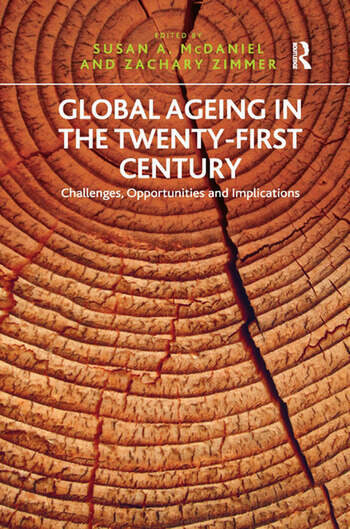 Given this variation in the context of global ageing as a backdrop, this edited book focuses on three overarching themes that are among the most critical to understand if societies are to age successfully in the twenty-first century and beyond: Healthy ageing and health care; the ageing workforce, retirement and the provision of pensions; shifting intergenerational relations. These three themes are cross-cut by other dimensions that are intertwined with the dynamic processes of ageing, such as immigration/emigration, contrasting policy regimes and global and national economic forces. This ground-breaking book will be of interest to all scholars, students and policy-makers working within this area of study. Professor Susan A. McDaniel, University of Lethbridge, Canada. Professor Zachary Zimmer, University of California at San Francisco, USA.